9-Year-Old Sits Down At a Piano and this happens! How many Pull-Ups can you do? Me? Nah… Even babies do better pull-ups than I do! Meet Jonas, a 9 month old baby, doing pull ups on the computer desk. Whether he is doing it to get closer to the computer screen or not, it is still amazing! Jonas surely have a strong arms to be able to do that. I wish I can too! I always give up after my first try. These adorable twins sign and talk with mom! Baby laughs are the best sound in the world don’t you think?! She Shocked Her Grandma On Prom Night, When You See Why You’ll Tear Up! 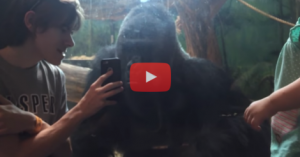 This Gorilla Was Bored…Until A Guest Showed Him THIS On His Phone! Cool!